YO ! It'S that time again ! yeS, unfortunately it is Sunday 🙄 After a stunning week of eating both of our body masses, drinking lots of celebratory champagne and visiting some great new places, we thought we would round it up and tell you all about it!! Truly in the whole of LDN there is nothing better than a breakfast at Claridges. We had the raspberry pancakes (obvz with gallons of maple syrup) and some good ol' poached eggs with avo! oUR NEW fav spot in Kentish Town. We needed to be healthy for at least an hour of the day, so this is our go-to place for a quick PHO Fix. C&D have a variety of healthy lunch options to choose from! Don't 4get a fresh juice!! For a spot of afternoon tea my dear. And a perfect tea at that!! Quite possibly the best tea we've ever eaten. Enjoy a lemon crab bun and a variety of sandwiches, followed by a selection of warm scones. Indulge in the most beautiful cakes & macaroons inspired by the autumn season. WASh it down with one of the many tea blends on offer. Lock Fyne is in a variety of places across London and if you love fresh seafood this is your place. There are many oyster bars in and around London but trust us when we say these oysters are life! Start off with a glass of prosecco, indulge in the NATURAL or LIME & TEQUILA oysters, and finish off with a seafood pasta or a fresher than fresh seabass! They also do ahi Poké which is def our new fav thing. Nothing beats a breakfast spread in a bed of dreams.. The pic speaks a million words! Our faves are thai calamari and goong tohd (breaded prawns) to start. Followed by a pAD tHAi with white crab meat, a massaman curry and chargrilled chicken! On the outskirts of London, Prime is a lovely steak restaurant, serving up the best Chateaubriand and the most extensive wine list. Very cosy and romantic for the winter months. Perfect for a date night and for a bit of comfort food. 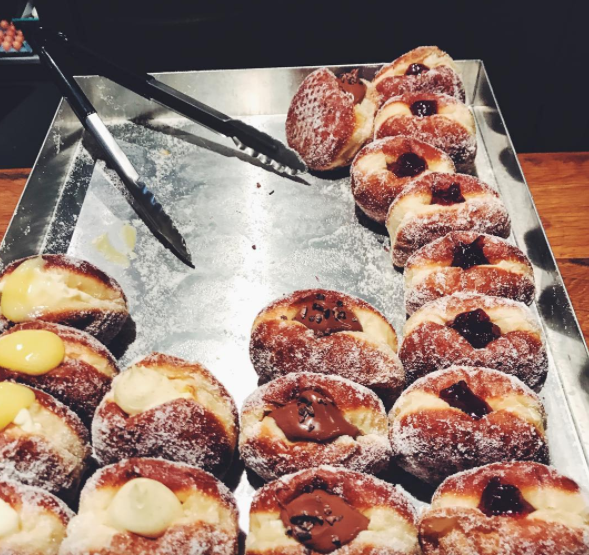 Think: 5 varieties of doughnuts from amaretto to nutella, the most insane salted caramel brownies, the list goes on you have to go! You could even go for breakfast for buttermilk pancakes and french toast!!! SRSLY!!! HAVE A GREAT WEEK PEEPS and be sure to visit all of these places! YOU MUST !